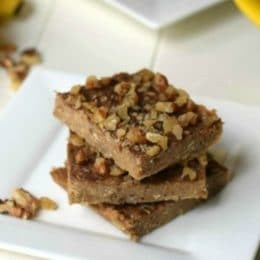 You only need healthy real food ingredients to make these 3 Ingredient Peanut Butter Banana Bars! 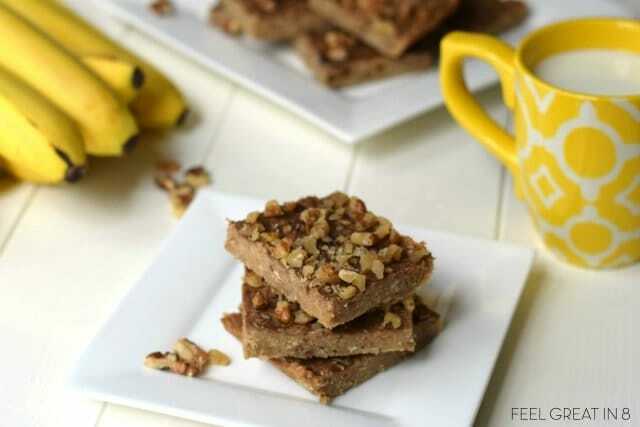 This healthy banana dessert is gluten free, dairy free, no added sugars, and perfect for quick & easy breakfasts, school lunches, or a healthy snack. 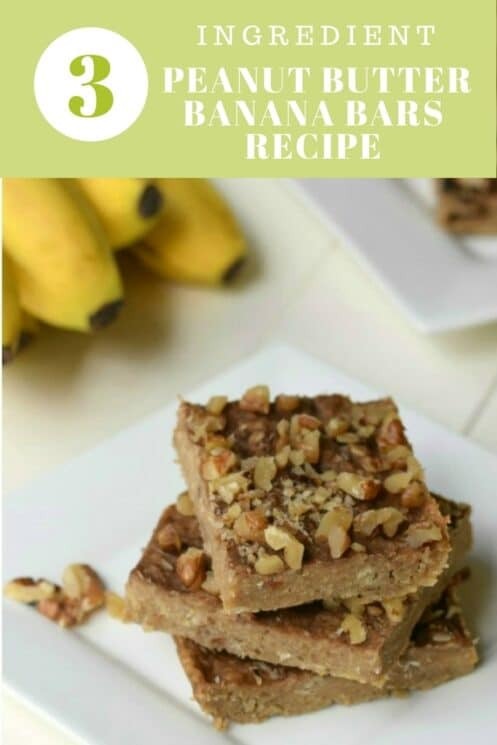 This 3 ingredient peanut butter banana bars recipe is so quick and easy and they are a favorite with all 4 of my kids, even my daughter who claims to hate bananas. One of my pet peeves is recipes that claim to be 2 or 3 ingredients, but include store bought mixes which mean they really include more like 20 ingredients. I’ve had so much fun experimenting with this recipe that literally includes 3 healthy ingredients – oats, bananas, and peanut butter. No added sugar, oil, or processed ingredients! And, they are gluten free (just make sure you use gluten free oats), sugar free, and dairy free. You can even leave out the peanut butter to make them nut free. As simple as the ingredients are, making these bars is even simpler. Just mash ripe bananas (the riper they are, the sweeter your bars will be), add oats and natural peanut butter, and mix. You can even just throw it all in a mixer. I love to double or triple the recipe and freeze the leftovers. Then I can pull them directly out of the freezer to put in school lunches. I can also let them thaw in the refrigerator overnight for breakfast or snacks the next day. I’ve even used variations of this same recipe to make peanut butter banana cookies and Coconut Banana Breakfast Cookies. Don’t you just love a healthy and versatile kid-friendly recipe?! – Tiffany is a wife, mom of 4, foodie, dark chocolate lover, creator and host of the Feel Great in 8 Challenge, and blogger at www.feelgreatin8.com. She loves experimenting in the kitchen and creating healthy real food recipes. Mash the bananas and mix together with oats and peanut butter. Spread the dough evenly in the prepared dish, then sprinkle with walnuts and chocolate chips. Bake for 18-20 minutes or until an inserted toothpick comes out clean. Cut into bars and enjoy! Can’t wait to try this! We don’t keep “junk food” in our house, but I have a hard time coming up with snacks for the kids besides plain fruit. I’m sure they will love these! Thanks for the recipe. That’s awesome Nicole! Hope your kids love them! Are these meant to crisp up a little? They’ve been baking for 30mins and still soft? This looks delicious. I am always looking for healthy dessert recipes for my family. I am looking forward to trying this one. Thanks for sharing! No problem at all Jenay! Hope you all love them! Making this now :). I love your recipes and make them for my 2 1/2 yr old daughter & hubby & I frequently! Where is the nutritional info for each recipe? Thanks so much :). These look so yummy! Thank you! Can you recommend a variation for one of my children who doesn’t care for bananas? I’d like to be able to include her too. I like these for everyone else though! Could you use PB2 in place of the Peanut Butter? Yes, PB2 would work great. How long will these keep please? They never last too long at my house, but they should keep for at least a week in the fridge. They also freeze great and would last there for months. What type of oats? Will the quick cooking kind work? I personally prefer rolled oats, but quick will work! Hi! Can you substitute almond butter for PB? Almond butter would definitely work! Avril, not sure where you live, but in the US you can get oats that are gluten free. Can you not get those? OK, did I miss the part about how to make the topping? I’m assuming melt the chips, add the walnuts, spread on top? Sorry, but I don’t bake but want to start doing so to make healthier sweets. It’s not clear in the instructions about when to add the toppings. Before or after they bake? I can see adding the nuts before they bake, but it seems like the chocolate chips would melt. Hi Cindy! You can do it either way. I’ve mixed nuts and chocolate chips in with the batter before, or added them before or after baking. If you top with chocolate chips before you bake, they will melt, so if you’d prefer they not, I’d just add them after the bars have cooled a bit. It’s a bit unusual that you would say this is a gluten free recipe – Oats are definitely NOT gluten free! It could cause some serious illness if one were to make this recipe and offer it to another saying it is gluten free! I made them this morning and they are pretty bland. I’m going to try the chips next time. I do use Bob’s Redmill gluten free oats. I have a sin who absolutely does not like peanut butter. What are some other things u could use as substitutes? Hey Nicole! Any nut butter would work. I’ve done almond butter and it was delicious. 3/8 of a cup? Do I have brain fade or ? How much exactly is that? 2/8 is 1/4 cup, 4/8 is a 1/2 cup. Is it about 1/3 of a cup? Never seen anyone use 8th’s. I get it now, just do it three times. I’m making these and love them. I’m adding organic cocoa powder + ground flax to my recipe (reducing oats). (I like to freeze them and eat them frozen.) My 7-year old son loves them too. I have made these twice now, not measuring the ingredients either time, but going by consistency of the mix before baking- such a great recipe! First time I added shredded coconut and a bit of honey while skipping the nuts and chocolate chips. Second time added chocolate chips, skipped the nuts (no coconut or honey). Both times were great! My 2 1/2 year old and 12 year old both loved them! What a great, versatile recipe; I plan on making this many times, and adding whatever I have on hand (I’m thinking maybe raisins next time)! Thank you so much!! With all these wonderful comments, I expected these to be really good. They were not. It may be a good base for a recipe, but you need more than 3 ingredients to make these things taste good. These definitely need some sort of a topping. I made them without a topping and they just taste like a very bland banana bread type thing. I’m going to smear some Nutella on top so hopefully that helps! Other than that, it’s a pretty good base recipe. I’m sure coconut shreds or some other addition would kick this up a notch! Can you use regular peanut butter versus natural? I used about half and half because that is what i had in hand, and it worked great. The dark chocolate chips I used did not melt during baking. Thus, they just fall off. Next time, I will either mix them in the batter or will press them into the batter before baking. Also, these bars are good, but very bland. I think some vanilla extract or cinnamon and/or a dash of salt might be good to add. Great recipe my whole family loves! Next time I am going to bake with walnuts on top (they get nice and toasty), and drizzle with melted choc after to hold the crumbs together a bit. Will try the almond butter recipe as well – thanks for posting! This recipe did not come out so good for me. The oats were hard to chew. I did not top with chocolate chips but still do not recommend. Did you use a sugar-free peanut butter? If not, would you recommend mixing in honey? Wow! So delicious and so easy! I mixed up some powdered peanut butter which made it even less calories and fat. I love this recipe. Also easy to split in half, simple measurements. Do you think it would work if I put cream of wheat instead. Just curious? Delicious! But instead of topping mine with walnuts, I topped it with a homemade “chocolate sauce” made with coconut oil, cocoa powder, and honey. I just made these and they were delicious! Thank you for the recipe! I had some ripe bananas and googled banana recipes. Mmmm. That’s great! Thank you Maria. I added dried cranberries, coconut and a 1/4 cup brown sugar…yummy! I made these for my husband as a healthy snack and he has ask for more. Ridiculous amount of pop ups. I refuse to use this site anymore because of it. Thanks so much. This recipe was just what I needed to use the ingredients I had on hand. I really wanted to love these. As I made them, the batter tasted bland, added some vanilla and a dash of salt. It tasted better. Cooked as directed and they crisped on top but were still gooey. Cooked longer, but they never got any less gooey or sticky. Tried them and they were GROSS. I threw the entire pan away. Waste of bananas and peanut butter. And oats. Just tried these with walnuts and they’re yum straight out of the oven. Thank you! Are they supposed to be like a rubber constituency? I think I put too many oats it and now the mixture is very thick ! How can I fix this?! Can I use steel cut oats or do they need to be rolled oats? Thank you very much was delicious I love sweets and this was very yummy. PERFECT! These 3 ingredients are staples in my workout routine. I was able to bring these on my travels to help me maintain my routine while away. They were fantastic! I bought nice brown bananas for a perfect sweetness. What other nut could go on top? These are so quick and easy to make and taste Delicious. I have a whole case of bananas to use up so I just made these. I almost doubled the batch (not enough oats to double so I added about 3/4 extra of everything). I then added cinnamon for flavor (we love cinnamon, didn’t measure) and unsweetened coconut for healthy fats (about .5-2/3 cup), plus some maple extract (again, didn’t measure). The batter was delicious and while it tasted different with the extract vs without, it didn’t taste like maple, meaning I didn’t add much. Oh, I also added some vanilla extract cuz we love that too. I baked for 20 minutes then left in the oven after I turned it off cuz it was still a little moist. Y’all, these are delicious!! They are not too peanut buttery (my kids love peanut butter, but not other food that tastes like it). Easy peasy to make! Forgot to add I didn’t not add any toppings. We were out of nuts and I was going to melt the chocolate and drizzle on, but wanted to taste them first. No need for the chocolate in my opinion. Easy to make. Everyone I serve it to loves it! I was wondering where you posted the chocolate frosting that you put on the 3 ingredient peanut nut butter banana bars ? I noticed you did not mention the chocolate frosting in your recipe . Thank you for your responce back.Or if you have a heathy chocolate frosting recipe that would be great too. It’s just melted chocolate chips! The directions are very unclear (i.e. use the big Pyrex even if the mixture is minimal because they are meant to be thin and will not hold into bars if they are thick.) Also, there is no “bake 18-20 mins, cut and enjoy” You have to let it cool before you cut. I really wish more effort was put into explaining this recipe because then I wouldnt have a disasterous mess on my hands. I may try it again now that I have learned what you are really suppose to do or I’ll just find a more detailed recipe. I had high hopes for this. Made it exactly as posted. Sorry but none of us liked this and I had to throw it out. I felt like the little flavor it had just wasn’t good. If you do decide to try it, the chips don’t melt on top so you either have to pour melted chocolate over the top or push them down into the mix before baking. this recipe sounds great could you leave out the chocolate chips use nothing or something else . Yes! I’d use nothing instead. I hate to give a bad review, but I tried these and they were terrible. I thought how could 3 ingredients taste any good, and I was correct; it was like eating a bland energy bar. The nuts and chocolate could not help at all. The texture was like gummy paste. I would at least add a drop of salt, stevia and cinnamon or something to give it flavor. I’m going to try this recipe today, I’ll let you know how it comes out. Perfect! Kids and parents all loved these!! These are FIVE ingredient bars! You don’t make them without those toppings, do you? I just made these tonight and they are so amazing! My entire family loved them! I doubled the recipe and used extra ripe brown bananas and OMG so delicious! I also topped mine with shredded unsweetened coconut and mini dark chocolate chips before baking and they came out perfectly. I baked mine for 30 minutes because of the double batch and that they were extra thick but let me tell you so woth it! My husband and kids are eating them right now and my husband just asked for seconds! We are eating them warm right from the oven and they are to die for! Thank you so much for such a wonderful, easy and healthy recipe! I made these today and my son is a picky eater and loved them! I think they’re pretty good also! Thanks for sharing! Oh and for the ppl that have not learned anything about manners… if you don’t like the recipe simply don’t make it! Seems to me that it takes more effort to complain and comment that you don’t like it than its worth, get over it! WOW! A 3-5 ingredient healthy treat bar! This is awesome! I’ve made oatmeal-banana cookies before. This is taking dessert to the next level! Will make them soon. Old fashion oats, or quick? Do I put chocolate on before or after baking? We typically use old fashion oats, but you could use quick. And put the chocolate on after baking. Add honey! The original recipe is very bland but I added honey and it tastes much better. Made today. They are awesome. Loved them. Will definitely make them again. Amazing!!! So simple and everyone loved them! Ha! You call it 3 ingredients and get on your soap box about your pet peeves, but then add 2 more ingredients anyway! Regardless, they are good. I like these! I did make a few adjustment/additions: I halved the recipe. I used steel cut oats. I added about 2 tablespoons of honey. I added approximately 1 teaspoon of cinnamon. I added a 1 ounce box of raisins for flavor. My “dough” was very thick, so I just spread it out on a silicon baking sheet to about 1 centimeter thickness. The dough held its shape. I cooked for about 20 minutes & let sit for about 20 minutes to cool. The consistency of the bars is soft and chewy, but I like it. If I had some brown sugar, I think I would have sprinkled on a very light dusting over the top before baking, just to really bring out all the flavors. Overall, I love how easy the recipe is & I think it makes a good snack. These are simple to make and you feel like you are eating something healthier than banana muffins or bread. I skipped the chocolate as I am allergic and they are still a good treat. My daughter and I are making these now! The look good! I guess it’s not low carb. That’s what I was looking for. Already had them in the oven before reading the nutrition label. These are good if you taste your batter prior to baking. There’s nothing in there that can’t be eaten raw. If it’s not Sweet enough, add some sugar. Not pb enough add more. Great base recipe to make it how youd like. I made an oatmeal style cookie out of them. I made these, and added just bit more PB cause hubby likes PB, I did not add chocolate cause Iam not a fan of chocolate chips ….they turned out pretty good. Definitely a keeper. Any idea of the nutrition, calories per square?